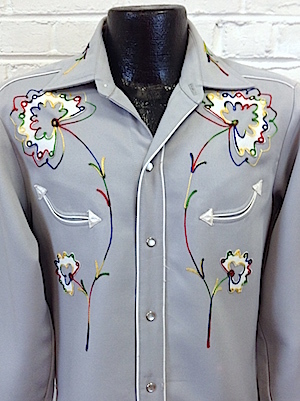 Mens vintage 1970s H bar C Polyester Gabardine Western Shirt! 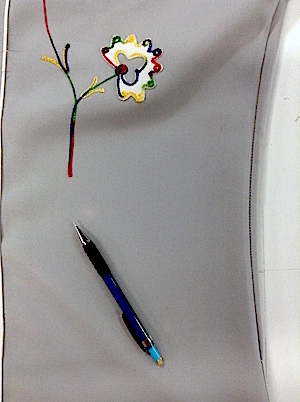 Gray base with white flowers embroidered in a rainbow colored thread of red, yellow, blue and green! There is also rainbow embroidery on the collar. Two smile pockets on either side of the chest done in white piping with embroidered white arrow tips. Cuffs, placket, shoulders and back yoke are outlined with white piping. Closes in the front with pearly white snaps and has five matching snaps on each cuff. Tapered hem. Tagged HBarC California Ranchwear, Texas. 100% polyester. Made in the U.S.A. Condition: Good++: Has what appears to be a large pink and white bleach stain on the back of the shirt. 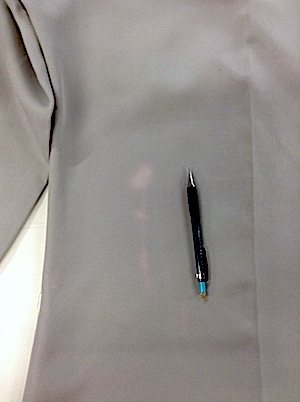 There are two more small pinkish stains near the large stain on the back. On the left side of the front of the shirt there are two small pink stains.. There is some loose stitching on the right side seam of the shirt. 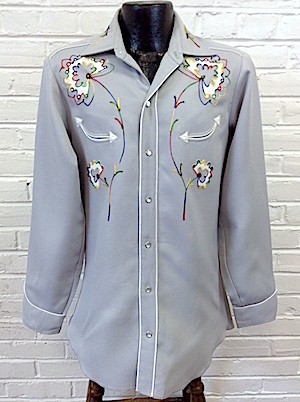 Has a few loose threads by the piping on the placket Still an amazing western shirt! Priced accordingly!